Aegina’s close proximity to Athens and its authentic island life are enough for this small land to have its own loyal fans. Useful info about this gem in Greece can be learned from Elina Argyri, the Founder of WeLoveAegina.com, a portal where travelers can find all necessary information about the island, from hotel suggestions to cultural activities. It’s interesting to highlight that Elina was not born in Aegina; although she did spend all her summers there with her family, made friends along the way, laughed, fell in love and explored nature. Elina has spent precious moments on the island and made lifetime memories. As she was growing up she realized this gem on the Saronic Gulf has so many things to offer, besides a summer vacation. “There is so much history here. Ancient temples, monasteries, museums, local festivals, charming little villages, and beautiful resorts. The island has so many things to show! This is how We LoveAegina started; it aims to properly re-introduce Aegina to Greeks and people from all over the world”. Elina already covered the next part of our discussion; what makes Aegina so special? It’s so easily accessible from Athens and the ticket prices are at such low cost. Furthermore, it covers all kinds of travelers; the adventurers, as it has many hiking options and beautiful nature to explore, the culture and history lovers, due to its rich history, the architectural monuments and museums, the ones who love water activities, the young travelers who need a vibrant nightlife and of course it’s ideal for families. 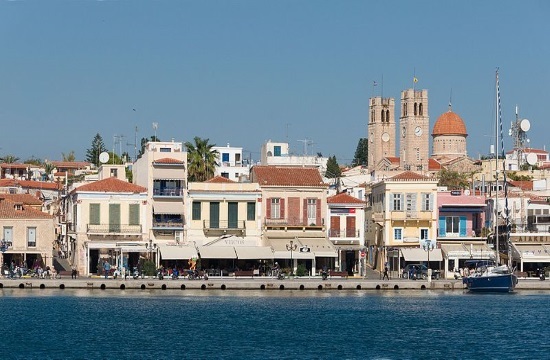 Aegina is an all-year destination and defies the belief that islands are only for the summer period. Aegina has its own Easter customs, during Christmas, there are various kids’ activities and in autumn you can explore the island without the summer heat! Travelers will locate any kind of useful information about the island in both English and Greek. People can book their ferry tickets, accommodation and they will also find details on everything they would like to do; from activities and festivals info to the best places to eat and have drinks or coffee. Lastly, the portal has gathered all useful phone numbers from local authorities and under the category Blog, you can read interesting stories about the island, written from locals or from people who have lived on the island.